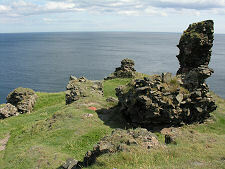 The ruins of Fast Castle cling grimly to a steeply sloping platform on top of a rocky promontory which projects from the cliffs just over three miles north west of St Abbs Head. 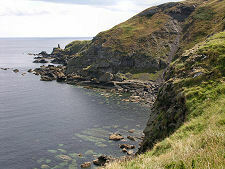 The site is surrounded by sheer cliffs which fall 150ft to the sea at its landward end and 100ft to the sea at its seaward end. 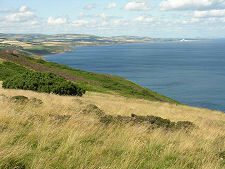 The sea cliffs to the north west and south east of the castle are around 300ft high, and the land behind them rises steeply to the 570ft summit of Telegraph Hill. You start the walk to Fast Castle from a signposted parking area just short of a farmstead at Dowlaw, itself two miles along a minor single track road from the A1107. 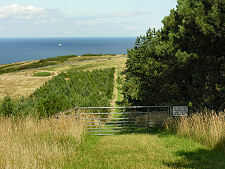 A nice grassy track descends and then climbs gently before becoming a path and running along the seaward flank of Telegraph Hill. This then starts to descend, and you catch your first glimpse of Fast Castle, far below you, as it does so. 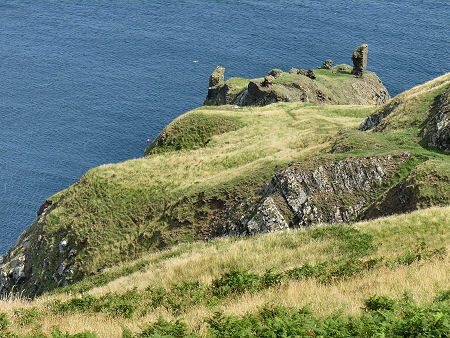 The walk from the parking area to the castle is a little under three quarters of a mile long, and from the high point on Telegraph Hill the total descent to the landward end of Fast Castle is a little under 400ft. 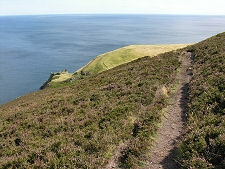 The path is fairly good with a couple of steeper sections, and lower down it skirts around the top of a gully dropping to the sea below. The platform on which the castle stands was originally only accessible via a drawbridge. 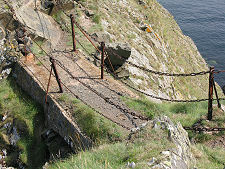 Today a concrete walkway or bridge crosses the gap, with rusting posts linked by chains to give a sense of security from the sheer drops on either side. The crossing was described as "modern" in 1921 and seems in reasonably good condition today: though it is worth taking great care as the consequences of a slip could be severe. At the far end of the bridge there is what on a mountain might be called a "bad step", a smooth sloping slab of rock perhaps three feet high, that needs to be scrambled over to gain access to the concrete steps above it. 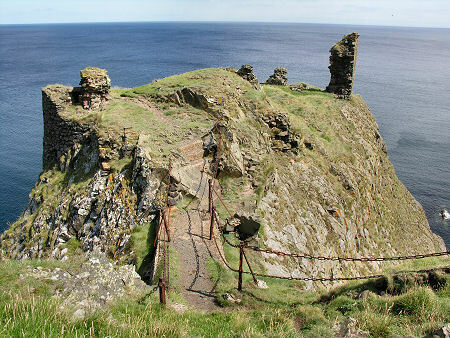 Once you reach the rocky platform on which the castle was built, you find that it is far less level than it seems from the approach. The landward end was home to a gatehouse guarding the drawbridge, while on the southern side of the platform was the keep. Beyond it the platform slopes steeply down past what seems to be a quarry: presumably it was easier to extract stone for the castle on site rather than carry it in. The whole of the top of the platform would have been surrounded by a curtain wall, creating a steeply sloping courtyard in which there were a few further buildings. 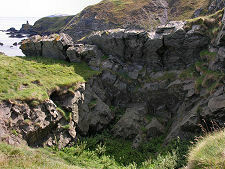 Accounts differ as to whether the castle had access from the sea, though this may have been by means of a basket and pulley from the rocks below or, according to legend, via a tunnel leading to a cave at sea level. A painting of Fast Castle completed in 1823 shows what was then a fairly well preserved ruined castle, with the obvious remains of a keep at the landward end and lengths of curtain wall extending back down the platform towards the seaward end. By the time MacGibbon and Ross visited in the 1880s, not much more remained than does today: fragments of standing wall which show where the keep once stood and a few pieces of what was once the curtain wall. It seems the keep was badly damaged when struck by lightning in 1871. This is ironic as this was also the fate of Wolf's Craig, inspired by Fast Castle in Sir Walter Scott's novel The Bride of Lammermoor, published in 1819. The first mention of a castle in this remarkable location was in 1333, though the site seems to have been fortified for centuries before. 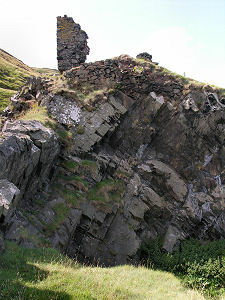 The English occupied the castle in 1346. 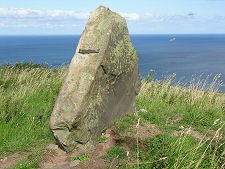 It was captured for the Scots in 1410 by Patrick Home, second son of the Earl of March. In 1503, Margaret Tudor, sister of Henry VIII of England, stayed at Fast Castle while travelling north to her wedding with James IV. 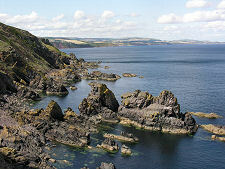 The castle was destroyed in 1515, in the aftermath of the Battle of Flodden, and rebuilt by the Home family in 1522. It was captured by Henry VIII's troops in 1547, but was back in Scots hands by the time Mary Queen of Scots stayed here in 1566. It was again briefly in English hands for part of 1570. 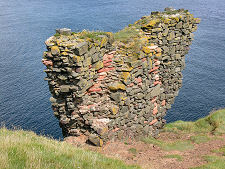 In 1580 Fast Castle passed by marriage to the Logans of Restalrig, who are said to have employed the mathematician (and reputed wizard) John Napier to search the castle for hidden treasure. Nothing seems to have been found. The Logans' estates were seized by the Crown in 1609 for their part in a conspiracy against James VI. Fast Castle subsequently passed through a series of owners and fairly quickly fell into disrepair and ruin.